Chaudhary Birender Singh at the National Review of State Ministers’ Conference on Sanitation and Drinking Water, in New Delhi on February 03, 2016. 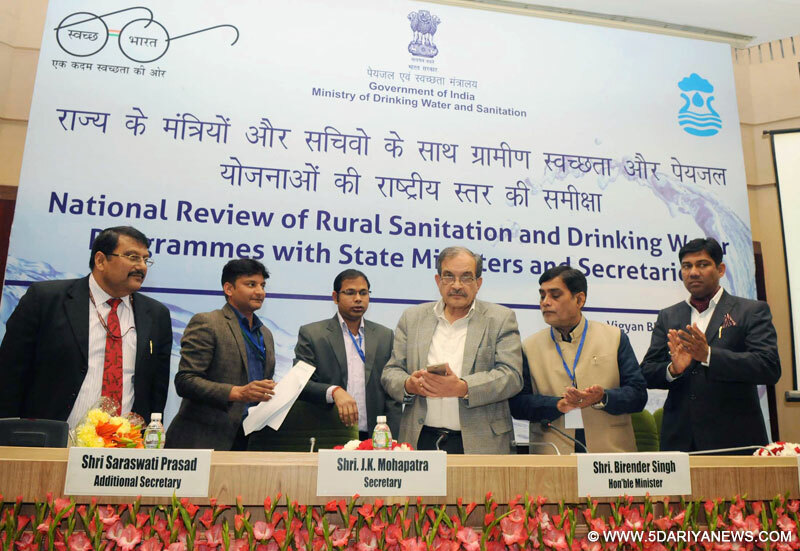 Asserting the Centre's commitment to Swacch Bharat Abhiyan, Union Minister for Drinking Water and Sanitation Shri Birender Singh today assured the States that funds will not be a constraint to achieve the targets of sanitation and drinking water in the country. Addressing a National Conference on Sanitation and Drinking Water here, he expressed satisfaction that the pace of construction of toilets in rural India has gathered momentum and the States like West Bengal, Karnataka, Rajasthan and Maharashtra have taken the lead in construction of Individual Household Latrines and community toilets. The Minister said that many of the States may achieve the target of Open-Defecation Free status in 2017 or 2018, well before the target of 2nd October, 2019. Sikkim and Kerala are now Open Defecation Free, ODF States. Shri Singh said that merely achieving the target of toilet construction will defeat the very purpose of swachhta mission, rather more importance should be attached to the sustainability of the programme and change in attitude. The Minister informed that 8 to 10 percent of the total Ministry’s budget will be spent on various campaign strategies in future. Shri Singh also underlined that the participation of the citizen and ownership to the programme is the key to success. He said that the solid and liquid waste management component of the Swachh Bharat Mission, SBM provides scope for small and medium private sector institutions to engage in waste management and improvisation of village environmental management infrastructure. In his address, the Minister of State for Rural Development Shri Ram Kripal Yadav said that at present about 49 percent households have toilets in the country and about the same percentage of population have been covered with piped drinking water supply system. He said, many states can achieve the target well before 2022 of providing at least 90% of rural households with piped water supply and at least 80% of rural households with piped water supply with a household connection. Shri Yadav informed that Kerala provides over 99% population with piped water supply, followed by 98.96 % in Tamil Nadu and 89.33 % in Gujrat. He also lamented that Bihar has only 5.5 % population getting piped water supply, while UP has about 9 % and Jharkhnad slightly above 10 % population getting piped water. Drinking water and Sanitation Ministers of 12 States like Rajasthan, Chhattisgarh, Gujrat, Haryana, Jharkhand, Maharashtra, Karnataka, Telangana, Punjab, Uttarakhand, Manipur, Nagaland participated in the conference, while other states were represented by Senior officials.